Well designed, easy to clean, cooks well, reasonably priced. None to mention. 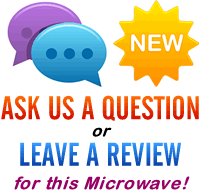 Looking to purchase a reliable mid sized solo microwave? 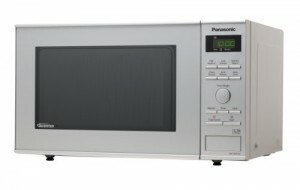 The Panasonic NN-SD261MBPQ features a 23 litre capacity, with a 950w power output, and is finished in a smart stainless steel exterior. 10 different auto programs are featured, which are set using the controls to the right hand side of the door. The buttons are very well labelled in a clear black font against the stainless exterior, and all of our testers found this silver microwave easy to operate. The interior holds 23 litres, measuring 31.5cm by 20.6cm by 35.3cm, and is pretty easy to clean, as well as being well lit courtesy of the built in interior lighting system. As per usual, the chaos defrost system defrosts well, without cooking the food or leaving any hot spots, unlike many of it's competitors. The digital display is clear and bright enough to be read even in a light environment, and the overall design of the microwave drew praise, and wouldn't look out of place in any modern kitchen. Our testers were impressed with the performance of this model; at 23 litres it may be slightly too small for very large families, but for the average household it should be fine. The NN-SD261MBPQ is quiet when in use, cooks very well, and looks sleek and modern. 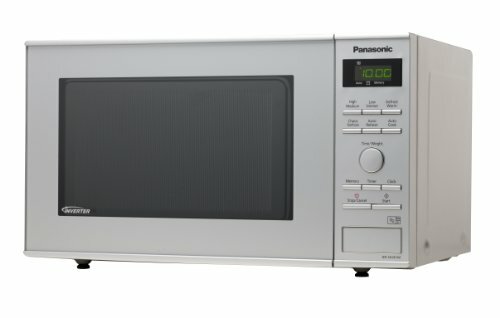 If you're after a mid sized solo microwave, then the NN-SD261MBPQ is well worth considering.